300 Bucks Damage – Pee-Wee’s Big Adventure Commentary! 300 Bucks Damage Pee-Wee’s Big Adventure Commentary! Gord and Kev watch Pee-Wee’s Big Adventure! We all know this clip. We’ve seen it a million times on countless VHS tapes growing up. I’m just curious to see if everyone connects this intro with a specific movie. For me, hands down, it’s Pee Wee’s Big Adventure. The first time I saw this clip it was before Pee Wee, and to my very young ears it seemed the cheezy intro music was specific to the movie because it sounded enough like the rest of Danny Elfman’s classic soundtrack. In the following year or two I would always be confused why different Warner Bros VHS tapes used “the Pee Wee music,” until I came to the conclusion that Warner Bros just really liked the Pee Wee “version” and decided to always use it, regardless of the movie. Yeah, I came to a lot of dumb conclusions as a kid. 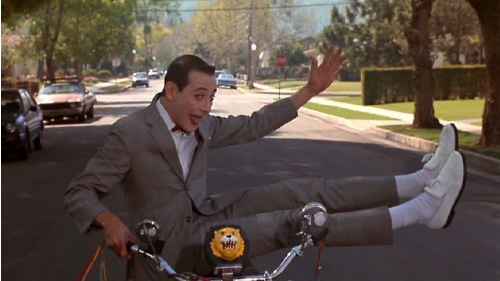 Regardless, later in life I would always associate that intro with Pee Wee. Always. A while back, I was saddened to pop in the Pee Wee’s Big Adventure dvd and not see it. It’s just not the same. You’ll find plenty of movies on this list that may not be considered among the elite in most people’s eyes, but that’s not what this is. The following films aren’t the most successful or necessarily even the best. These are just a a bunch of awesome movies I could watch over and over again. Also, instead of doing a boring review, I’m just listing a few of my “favorites” from each film. Honorable mentions: Coming to America, Field of Dreams, Pumping Iron, Ghostbusters, Private Parts, Manhattan, Good Fellas. Logline: You’ve read the ad, now see the movie! Logline: All the fun of college, none of the education. Logline: His news is bigger than your news. Logline: The story of a rebel and his bike. Logline: Come as you are. Logline: Nice guys finish last. Meet the winners. Logline: You have a ringside seat for the bloodiest bicentennial in history! Logline: When these three oddballs try to play hardball, the result is totally screwball. Logline: Registration starts Friday, June 13, at theaters everywhere. Logline: There can be only one. Favorite Scene: Kurgan & Connor in the church. Logline: Coctails first. Questions later. Logline: He was never in time for his classes . . .Then one day he wasn’t in his time at all.